It is obvious the endocrine glands correspond to and operate within the interetheric level of Mind and Matter, Keely's sixth subdivision of matter and energy. See Etheric Elements and Mind Force is a pre-existing Natural Force. 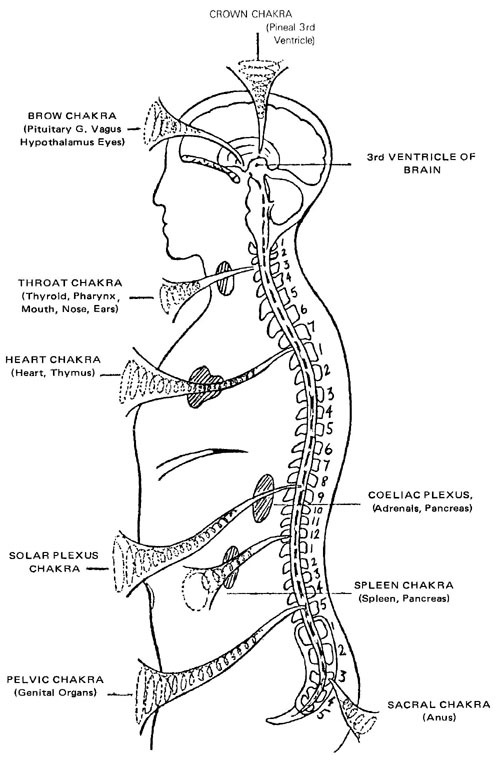 They are the bridge or connecting link between Undifferentiated Mind or Spirit and the physical body. This connecting link goes a long way to explain the idea mind is cause and the physical body manifests the effects of thought held in the Mind or Consciousness. This connecting link between mind and matter as part of the human organism explains how and why ideas or thought held in the consciousness affect the body and the body thereby mirrors the mind whether in health or disease. See Revelation a description of the psycho-physiological changes in a person as they Awaken; i.e., change thought patterns from low material consciousness to high or spiritual consciousness. "There are centers, areas, conditions in which there evidently must be that contact between the physical, the mental and the spiritual. 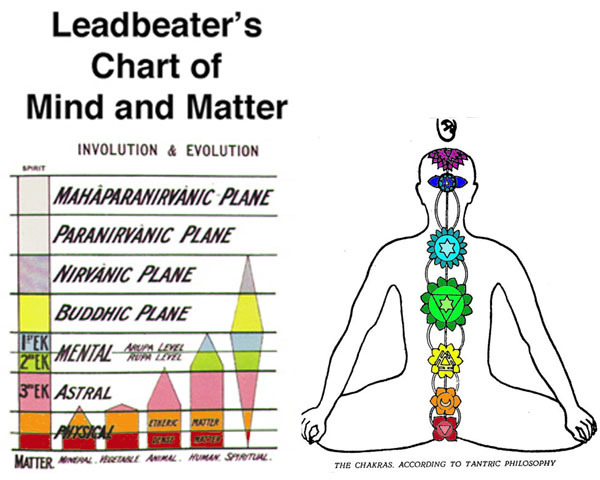 The endocrine system corresponds to levels or types of consciousness as evidenced with the Chakra System in Tantric Yoga and explained in Revelation. Seven Churches mentioned in Revelation are the seven endocrine glands or chakras. (There appears to be a discrepancy, to be resolved, with the Spleen and Gonads.) 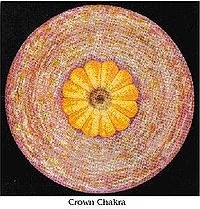 Notice the similarity of the chakra images with Orbs. Q - "Are the following statements true or false? Comment on each as I read it: The life force rises directly from the Leydig gland through the gonads thence to the pineal, and then to the other centers." "One life force is the body-growth, as just described. The other is the impulse that arises, from the life center, in meditation." Q - "As the life force passes through the glands it illuminates them." A - "In meditation, yes. In the life growth, yes and no; it illuminates them to their own activity in life growth." Q - "The Leydig gland is the same as that we have called the lyden, and is located in the gonads." R1. PITUITARY BODY (Copied from Gray's Anatomy) - Function: Extracts give a substance which causes constriction of the blood vessels with rise of arterial blood-pressure. This substance seems to have a stimulating effect on most of the smooth muscles, acting directly upon the muscle causing contraction. It also increases the secretion of the urine; of the mammary glands when in functional activity; and of the cerebrospinal fluid. Many authors regard the pars nervosa and the pars intermedia as the posterior lobe. Enlargement of the hypophysis and the cavity of the sella turcica are found in the rare disease ACROMEGALY, which is characterized by gradual enlargement of the face, hands, and feet, with headache and often a peculiar type of blindness. The blindness is due to the pressure of the enlarging hypophysis on the optic chiasma. THE DUCTLESS GLANDS (Gray's Anatomy) - Certain organs very similar to secreting glands, but differing in one essential particular, viz., they do not possess any ducts by which their secretion is discharged - that is to say they are capable of forming, from materials brought to them, INTERNAL SECRETION in the blood, substances which have a certain influence upon the nutritive and other changes going on in the body. This secretion is carried into the blood stream, either directly by the veins or indirectly through the medium of the lymphatics. 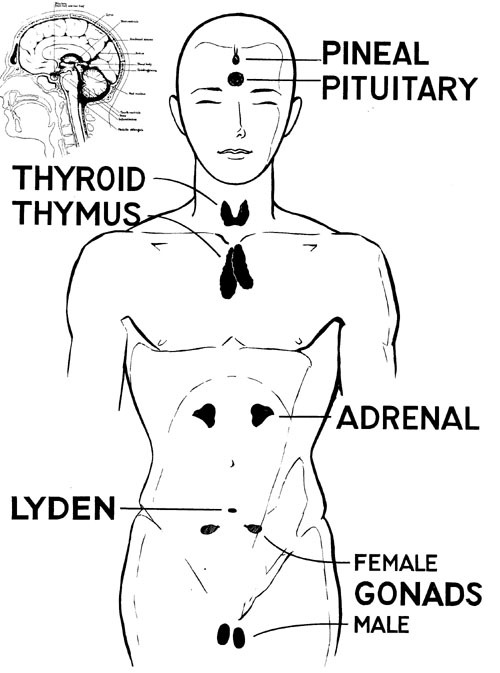 These glands include the THYROID, the PARATHYROIDS and the THYMUS: the PITUITARY BODY and the PINEAL BODY; the chromaphil and cortical systems to which belong the SUPRARENALS, the PARAGANGLIA and AORTIC GLANDS, the GLOMUS CAROTICUM and perhaps the GLOMUS COCCYGEUM. The SPLEEN is usually included in this list and somtimes the LYMPH and HEMOLYMPH NODES described with the lymphatic system. Other glands as the liver, pancreas and sexual glands give off internal secretions, as do the gastric and intestinal mucous membranes. R2. 8/29/42 See rdg. 2803-1, example of glands affecting entire body. R3. 3/6/43 See 281-63 on glands. Keely Presentation a PowerPoint presentation (in pdf format) presenting SVP, endocrine system and many other correlated topics.